Upstanders start by thinking about issues that concern them. They want to do something about what they see, and ultimately, they take action. It isn't always easy—taking action is not a guarantee for success. But regardless of the outcome, an upstander makes a difference. 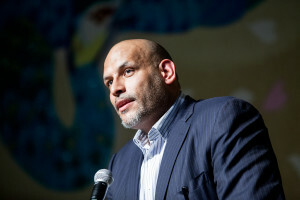 In April 2014, Facing History hosted a community conversation featuring John Amaechi at the Aratani Japan America Theatre. Amaechi is perhaps best known as an unlikely basketball star from Britain and the first former NBA star to come out as openly gay, but that evening he shared his message of the importance of knowing oneself and refusing to let others define us. Mr. Amaechi reminded us that upstanding takes many forms and that our simple acts of kindness can transform others in ways we might not even realize. That evening we also wanted to recognize the acts of transformative kindness and upstanding by members in our Los Angeles Facing History Community. Educators in our Los Angeles Partnership Schools Network were invited to select a upstander (s) from their community to be recognized at this event for our end of year celebration. We are pleased to honor the following individuals and groups whose choices have made a positive impact in their school communities and beyond. Sandy Castro, Jessica Ceja, Cande Rivas, and Daisy Sanchez are four incredible young women who have advocated tirelessly for garment worker’s rights in Los Angeles. After selecting this topic for their Ethnic Studies Senior Action Project, they researched the conditions of local sweatshops and strategized ways they could positively impact the lives of factory workers. Though they did not have funds to purchase the necessary supplies nor were they a welcome presence at the factories (in one instance they were even chased from the premises!) 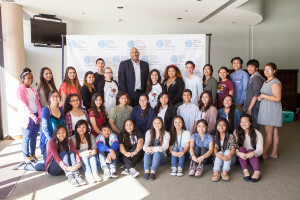 this group of dedicated students persevered and successfully provided first aid kits and fire extinguishers to three different factories in Los Angeles. When this group learned that armed military groups in 24 countries have taken over schools and universities to use as weapons facilities, prisons, and even torture centers, the Human Rights Watch students at AMA Carson sprang into action by designing a visual campaign. Students then began sharing their campaign by hosting awareness days with other clubs, using social media such as Tumblr, Facebook, Twitter, and Instagram. Their biggest campaign was on Valentine’s Day when they hosted the “4 the Love of Education” event. Inspired by their success, the students are currently planning to do presentations for local middle schools and are working to meet with an elected official to get support for a resolution to end military use of schools. After an informal survey of 200 students confirmed suspicions that there was a bullying problem on campus, the Leadership Students at Bethune Middle School, with the help of their advisors, Mr. Hagaiwara and Mrs. Nguyen-Bollinger, began a school-wide Anti-Bullying Campaign. They held separate screenings and facilitated discussions of the film BULLY for parents, faculty, and students. In February, all 1,300 students at Bethune were invited to participate in an anti-bullying poster contest and the school received over 300 entries. The Leadership Students used these entries to create an Anti-Bullying gallery and organized an Anti-Bullying event which included activities such as watching a spoken-word video on bullying, creating poems in response to bullying, voting for the best Anti-Bullying poster, and signing anti-bullying pledges. Due to the increased awareness of bullying on campus, many students have volunteered to attend peer conflict mediation training because they too, want to be part of the solution. This impressive group of young people is currently drafting a letter to the principal with suggestions of how to continue and extend anti-bullying efforts on campus next year. Mrs. Kendra Mc Lean and Dr. Gayle Windom created the first annual Anti-Bullying Month at Watts Learning Charter Middle School and with their hard work and enthusiasm rallied the entire school community to participate in the events. They hosted a “Trust and Team Building Day” complete with obstacles courses, created an Anti-Bullying T-Shirt which was worn by the community every Wednesday, and organized an Anti-Bullying Assembly with video and power point presentations, singers, dancers, and motivational speakers. The school would also like to recognize Ramon Castillo, Corina Franco, Londy Hernandez, Daizy Ortiz, and Araya Ragsdale who contributed their optimism, diligence, creativity, courage, strength, and dedication to make the school’s Anti-Bullying Program a success. Valeria Padilla and Laura Hernandez, two active members of the Gay Straight Alliance, have been instrumental at Los Angeles School of Global Studies in creating a safer and more inclusive community. By organizing the Day of Silence at their school, they encouraged students to show their support of LGBT youth and to use their vow of silence as a way to take a stand against anti-LGBT bullying, name-calling, and harassment. Their efforts have raised awareness of the issue on campus and have increased a greater sense of community and compassion. 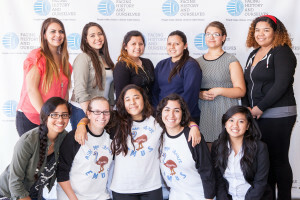 Romeo Alaron, Eric Benitez, Jezebel Cruz, Dalton Guardado, Sheily Lopez, Kelly Marquez, Ariel Morales, and Angela Segura are the founding members of Student Council at Valor Academy Charter High School in Pacoima, who dedicated themselves to creating a safe and inclusive school community and raised awareness about the importance of upstanding. Last November, these students spearheaded a week-long anti-bullying campaign and organized daily events to bring critical awareness to the issue as well as inform students how bullying negatively impacts both individuals and entire communities. Using student presentations, videos, events such as “jersey day” and the sharing of personal stories about the impact of bullying, this outstanding team of young people empowered and encouraged every student at Valor Academy to take decisive actions against bullying and to create a school environment where all students feel safe. The mid-year survey revealed that 80% of the students at Valor Academy reported that they had not bullied or been bullied at school. Principal Roseann Cazares and 12 students created H.E.A.R.T., Human Efforts Aimed at Relating Together to help strengthen and build community on campus. To raise awareness about bullying and the impact it has, H.E.A.R.T. organized a 9th grade assembly which included a skit, facilitated discussions, a screening of the film BULLY, and a student panel where teens shared their experiences of bullying or being bullied. After the H.E.A.R.T. assembly, a 9th grade student revealed his concerns to the principal about a peer who had planned his own suicide, and as a result, the school was able to get the student in crisis some much needed help. Because H.E.A.R.T. delivered such a powerful message that one person can make a difference, and that we must speak up for those who cannot speak up for themselves- a student felt compelled to seek help on behalf of a classmate and possibly saved his life. As a student leader and president of the school’s Gay Straight Alliance, Jennifer Novoa has galvanized her school around the issues of bullying and advocating for the LGBT community. Ms. Novoa coordinated a panel discussion on bullying to bring awareness of the issue on campus and worked with the GSA club to organize a full day of events for the Day of Silence where students were inspired to participate in activities such as making tie-dyed shirts, creating speaking out cards, and placing tape over their mouths to bring attention to the silencing of many LGBT youth. Ms. Novoa also initiated a remembrance event where students came together to share music, poetry, and hold a candlelight vigil in honor of LGBT youth who have lost their lives as a result of discrimination. Nia Huggins, an active member of Senior Class Cabinet at Student Empowerment Academy, met with the principal to devise a plan to continue the Anti-Bullying Campaign that began last year with Facing History. Using clips from the film BULLY, Ms. Huggins created anti-bullying presentations and included additional video to make the presentations specific to the SEA campus. Ms. Huggins also empowered her peers by training multiple student presenters to participate in question and answer sessions about bullying. Because of Ms. Huggins’ dedication to ending bullying on campus, her classmates have taken on a dynamic role in creating a safe school community and demonstrate a greater willingness to come forward on issues of bullying. Fatima Alvarado is both a vital peer resource and a model for upstanding at the Social Justice Humanitas Academy. Ms. Alvarado has served as a student mentor for the past three years and currently leads a team of sophomore and junior mentors with a caseload of more than 40 students. Ms. Alvarado meets with her own mentees on a weekly basis and does whatever is necessary to lend fellow students both academic and emotional support. School Counselor Carol Montes de Oca says, “Fatima is charitable and caring by nature. She is an empathic listener and no matter how busy she is, she always makes time to help others.” Teachers describe Ms. Alvarado as a mature and dedicated student who lives by her convictions and has “no hesitation in doing what she feels is morally right despite the possible repercussions.” Multiple students name Fatima as their role model, their inspiration, and their source of encouragement in challenging circumstances. Naomi Sugimoto has dedicated herself to building a stronger sense of community throughout the Miguel Contreras Learning Complex. This year she helped students bring awareness to the plight of street vendors by creating a book to share their stories and struggles. Additionally, Ms. Sugimoto initiated the Oak Grove Club which brings people together from all four small learning centers at the Miguel Contreras Complex. This student-led club addresses race relations on campus, provides a forum where students can openly discuss their feelings, and gives young people an opportunity to make connections with peers in their community they might not otherwise meet. As leader of the Environmental Program at ESAT, teacher Latiffe Armado is a passionate advocate for students. This year Ms. Armado’s efforts were combined with those of students Armando Herrera and Stephanie Intal, and together these three have kept environmental issues at the forefront. They cared for trees on campus, planted trees in the community, organized an L.A. River clean-up day and took students to an environmentalism rally. They also pushed to create an Environmental Studies Senior Elective and get A.P. Environmental Science into the academic program. Because of their efforts, the school recently started a student-led composting program and began the construction of a community garden funded by a grant from the Annenberg Foundation. As a result of their resolution to make environmentalism and community activism as part of the school’s academic program, both are now written into the ESAT six-year action plan which was recently approved by WASC. Kimberly Smith, the Title 1 and Bilingual Coordinator at ArtLAB, has a gift for making everyone on campus feel seen, heard, and supported. Whether she’s advocating for students in the special education community, sharing educational strategies with colleagues, taking the time to hear and address the concerns of parents, or initiating an outreach program to teach positive coping strategies to at-risk young women, Ms. Smith steps into whatever role necessary to assure that the all members of the school community are cared for. Ms. Smith’s dedication to the success and well-being of all ArtLAB stakeholders has touched the lives of the entire school community. Jennifer Anaya works to teach history through a critical lens. Ms. Anaya requires that students are not merely problem solvers but also problem posers. She encourages students to make connections between the history of past and the ethical dilemmas of today and employs active discussion and reflection in her classroom to model for students the school’s five core principles of leadership, excellence, integrity, justice, and community. Ms. Ayana inspires her students to be more than scholars, she cultivates them to become agents of change. At the mid-year survey, 85% of students at Valor Academy reported feeling encouraged to explore new ideas in class, demonstrating that Ms. Ayana has fostered both a sense of curiosity and vitality in her students. Click here to see Facing History's resources to combat bullying. Find out more about our work in the Los Angeles-area.